The VariZoom SnapCrane VZ-SNAPCRANE12 is the standard configuration in the SnapCrane camera crane series. It offers 12' 6" vertical extension and comes with a tripod, dolly and soft sided padded case with handles and shoulder strap. The SnapCrane is a compact, modular crane design. It offers various configurations for specific applications. Utilizing specialty heavy-gauge tubing for the single-section legs and a solid baseplate machined from a block over 2.5" thick, the CT-100 is built to extreme standards of rigidity and durability. The stainless steel leveling feet offer up to 3" of adjustment, while the padded carrying case makes transport comfortable and safe. 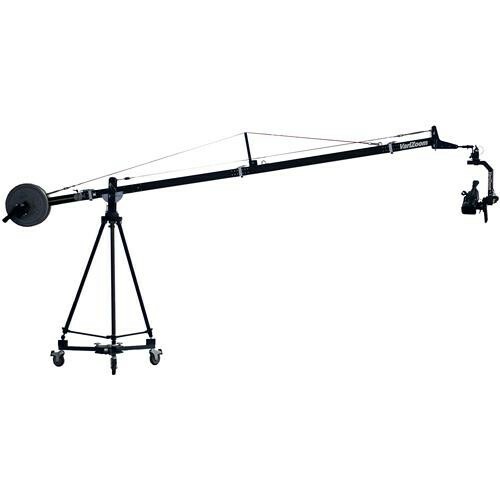 Accommodating heavy or light tripods with mid level spreaders, this platform is ideal for moving large setups over flat ground. Locking wheels keep your tripod immobile during the shoot. When you are finished filming, this dolly folds down into a compact size for easy transportation to your next location.